A start-stop system stops the engine when the car comes to a halt, for example, in front of a traffic light or during a traffic jam. The engine automatically restarts when pressing the clutch or the accelerator. Obviously, this saves fuel and reduces emissions. Reason to doubt: Cars consume little fuel when halting. Starting the engine more frequently might wear out starter motors or batteries faster, increasing service cost. TCS, a Swiss automobile club, has performed such tests in 2013. The study itself has not been published, but I have received a copy on request and the permission to show below table extracted from it. Other references to this study (in German) can be found in an article in their monthly magazine, a campaign to encourage switching off the engine, and similar articles. Translations: The left column shows the tested car model, its year of construction, and the type of fuel (Benzin for gasoline). 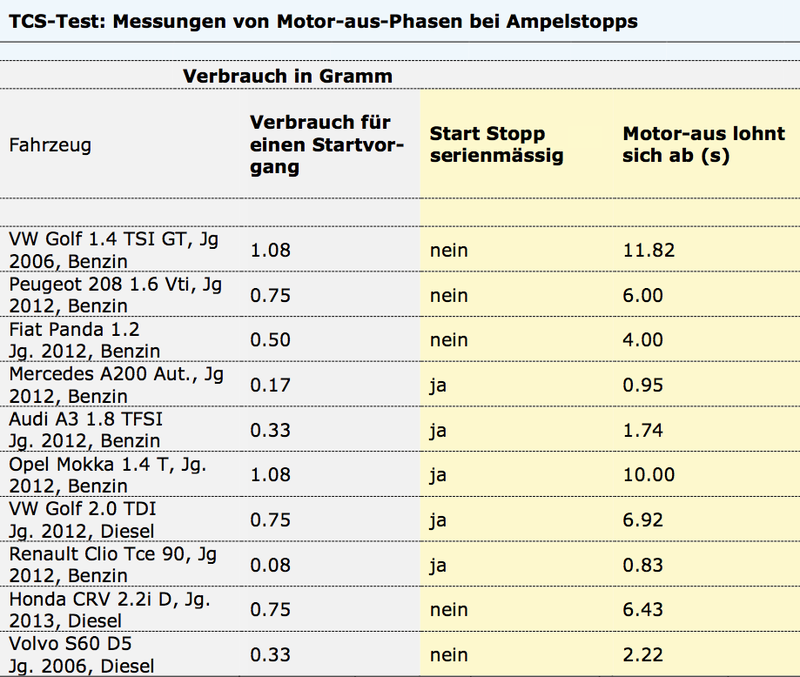 The second column shows the measured consumption in grams per warm start, the third column the presence of a start-stop-system (ja=yes, nein=no). The right column indicates after how many seconds switching the engine off saves fuel. In conclusion, you should switch off your engine when you expect that your stop lasts for 5-10 seconds or more. This test focuses only on fuel-efficiency. Comparing the fuel savings with potential service cost is unrealistic in my view, as fuel prices vary widely (in time due to the oil price and by location due to taxes and subsidies) and should also include external costs related to emissions as well as fines (60 CHF in Switzerland for not switching off, though rarely enforced). Not the answer you're looking for? Browse other questions tagged road-vehicles .